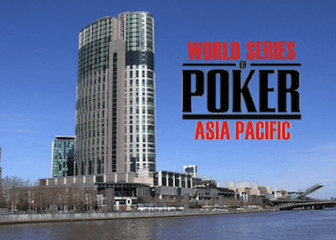 The inaugural World Series of Poker Asia Pacific tournament series (WSOP APAC) kicked-off with the first of its kind “Accumulator” tournament on Thursday. The WSOP APAC series began amidst much hype, fanfare, and anticipation, with 2005 World Series of Poker Main Event Champion and Australian native Joe Hachem was given the honor of the “shuffle-up and deal” call, and from there the WSOP APAC was off and running. The Accumulator event is an innovative take on reentry tournaments, allowing players to register on all three starting days, but unlike the typical reentry event players can reenter on subsequent days even if they’ve already punched their ticket to Day 2. By reentering players can combine their chip-stacks from all three starting flights heading into Day 2. Day 1a of the event saw a very strong turnout of 392 players –the tournament has a $1 million guarantee and it looks like it will easily surpass that number—with a number of well-known poker players taking their seat at the Crown Casino for the historic tournament. By the end of the night just 47 players had punched their ticket to Sunday’s Day 2. Leading the charge on Day 1a was online legend Dan Kelly, who took down a pot 66,000 chip pot to land at the top of the leader-board on Day 1a. According to the pokerlistings.com live reporting on the WSOP.com website, Kelly flat-called an All-In from a short-stacked player on the final hand of the night with Pocket Kings, only to see Didier Guerin put in a sizable three-bet. When action got back to Kelly he pushed All-In and Guerin was priced-in to call with his AQs. Kelly flopped a set, faded a flush-draw, and scooped the massive pot. Kelly isn’t the only big name who thrived on Day 1a, joining him in the Top 10 are two Team PokerStars Pros; Barry Greenstein and Jonathan Duhamel, Also punching their ticket to Day 2 were Phil Hellmuth, Mike Watson, Mike Leah, and Minh Nguyen. Day 1b will kick-off at noon local time and I would expect to the field size to be larger than Day 1a –Day 1b could see the total number of entries surpass 1,000, already ahead of the $1,000,000 guarantee.